A year ago today, my first post on this blog went live. So today is my first blogiversary. 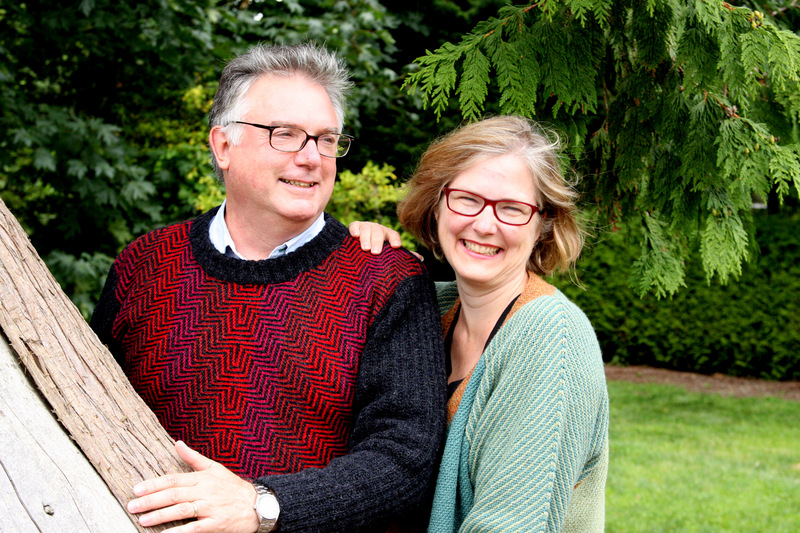 Looking back over the year of posts, I found my eye drawn to a photo of me, sitting in my back garden, knitting the sleeves on a pullover I was making for my husband, Doug. 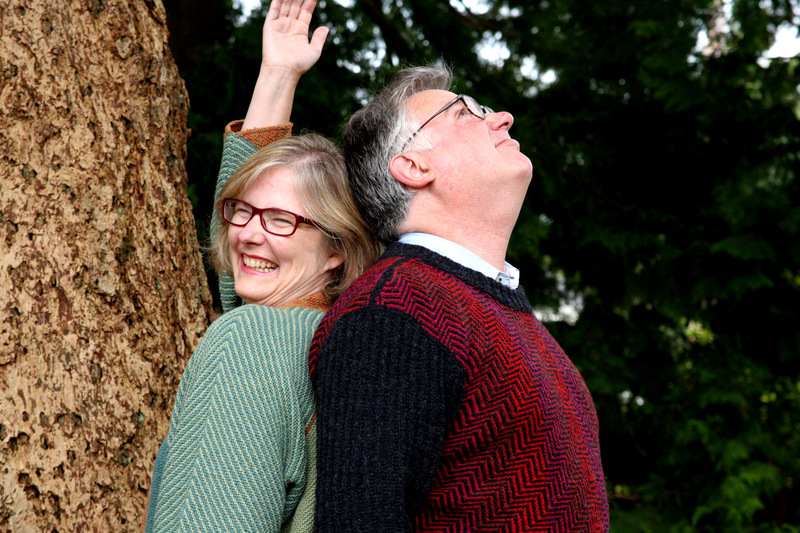 The post was whimsically called “Do you love your husband enough to knit the sleeves?”; you can find it here. The pullover I was knitting is Brick, a design by Hanne Falkenberg. 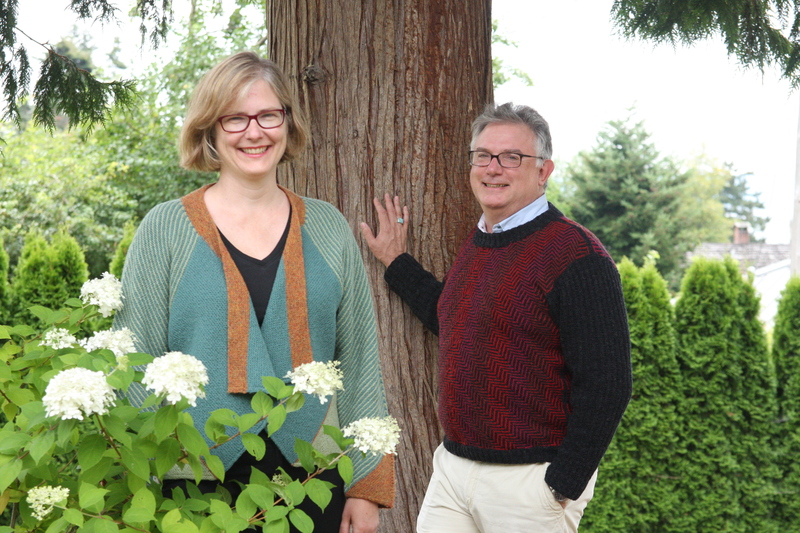 Looking over the photos, I realized that the jacket I was wearing while sitting out in my garden knitting Hanne Falkenberg, is itself a Hanne Falkenberg design, called Decapo. I think these photos really pick up one of the things I love about her designs – the interplay of colours, the beautiful quality of the wool, the intriguing designs. It is a feast for the eyes. For me, however, these two projects represent distinct stages in a knitting life. Allow me to reminisce. I learned to knit as a child. Both my mother and my grandmother were knitters. (I wrote a series of posts in which I showed some of the vintage garments my mother and grandmother knit in the 1950s, ’60s, and ’70s; you can find those posts here.) I don’t remember which of them first put the needles in my hand, but I remember knitting a cabled afghan when I was 6 or 7 years old. It was knit in strips, each about 6 feet long, with a cable running up through a reverse stockinette background, and moss stitch edging. I continued to knit, as well as doing embroidery, needlepoint, macrame (everyone did macrame in the 70s! ), and other crafty things, but knitting did not reach out and grab me until the summer I turned 15. I went to visit my grandmother in California that summer for a month. At the time, she was working in a yarn shop. She took me to work with her the first day, and I immediately picked out the yarn and a pattern to knit a sweater. It was bright orange mohair (this was, after all, the 70s) and I knit a cowl neck sweater with 6 inches of ribbing on the waist and sleeves, and a huge ribbed cowl. I became obsessed. I knit all day at the shop and then went back to my grandmother’s house and knit through the night while sitting in her LazyBoy recliner, watching really awful late night television shows and eating potato chip cookies (don’t ask – we ate things like that in the 70s). It took me three days to finish that sweater and then I started another right away. It was in a soft rose colour and knit side to side in a jacquard pattern with dolman sleeves. By the time I left my grandmother’s house, I had three finished sweaters in my suitcase and another on the needles. I was really obsessed and stayed that way for years. When I was a college student, I became quite ill at one point and spent most of seven weeks in bed. This was before the days of internet ordering and it was not easy to obtain yarn while stuck in bed. This is what I did for those 7 weeks: I knit a sweater. Then, when I was done, I frogged it (for you non-knitters, this means I ripped it all out) and re-used the yarn to knit another. Repeat. Repeat many times. As you might gather, I was a process knitter at heart. Having a finished sweater was nice but not necessary; the process of knitting soothed something in my soul. In graduate school I always had my knitting with me. I was at MIT, the hub of all things engineering, and knitting was seen as rather frivolous and girly. The men I think just found it odd, and the women accused me of perpetuating female stereotypes. (Knitting was seen as an antifeminist manifesto, but that is the subject for another post.) During my final year, I would sit at my computer for hours at a time writing my dissertation, and then, to relax, I would knit. I ruined my hands. Two months after I submitted the dissertation, I developed such terrible hand and wrist pain that I could not knit at all. (I also could not cook, or type, or write, or much of anything else involving one’s hands.) It was diagnosed as DeQuervaine’s tenosynovitis, caused by repetitive stress. I was convinced to undergo surgery. I have heard that this surgery is usually very successful, but in my case it was not. I could not knit. For the next 15 years, I could not knit more than a few rows without feeling pain. In that 15 years, I think I knit four sweaters: a small blue cabled toddler’s pullover (which took three years – it was intended for my nephew Mitchell but ended up for my daughter Emma), the red jacket for Leah at age three, a cute pullover for Emma, and a gansey fisherman’s pullover for Doug. That was it. Each of them progressed painfully slowly. If I got caught up in the knitting and tried to knit more than a few minutes, I would pay for it with a few weeks of pain. I mourned my knitting. Not for the things I could have knit, but because I missed the knitting itself. For Christmas 2004 Doug bought me a Hanne Falkenberg knitting kit, for the Decapo jacket, in two shades of green and a completely gorgeous shade of rusty-orange with green tweedy undertones. I was flabbergasted. First, by the wonderfully thoughtful and beautiful gift, which was a complete and total surprise. Second, by my sudden drive to knit this beautiful sweater and become a knitter again. I was determined not to let my repetitive stress injuries take my knitting away from me. I don’t know what it was about this particular jacket that inspired me; I think perhaps it was that Doug gave me the right knitting project at just the right time. I also don’t remember everything that I did to get past the pain. What I do know is that I had to change the way that I knit and analyze the knitting process. I started doing exercises to try to strengthen my hands and wrists. I would soak my hands in hot water before knitting and do gentle stretches. I would stop every 20 minutes and shake out my hands, massage my fingers, and give my hands a break before starting again. I thought a lot about the process – how I held the needles, how I moved my hands, how I placed my shoulders. Before the injury I had been a speed queen. I knit really fast, and I would knit for hours, literally, without a break. Now, I found that I had to slow down; I purposely slowed down each stitch. I think that before I had enjoyed the speed, getting into a zen state where my fingers would fly; now, I had to use the rhythm more than the speed to get to that state. It took me 15 months to knit that Decapo jacket. But I was once again hooked. My whole relationship with knitting had to change. I was never again going to be able to knit for hours a day. My maximum, even today, is about 10 hours a week. I try to knit an hour every weekday and two on Saturdays and Sundays. As a result of this, I became more of a product knitter. I began to produce finished garments again, and to resist startitis (constantly casting on new items as the allure of the new outstrips the appeal of finishing the piece in hand). Last year I knit 11 items – a skirt, a cowl, a hat, a shawl, a dress, and six sweaters. The Brick pullover, my second Hanne Falkenberg pattern, was knit this year at a time when I can feel that my relationship with knitting is changing again. For a while, after Decapo, I was all about the finished product; making beautifully fitted sweaters for myself and my daughters. But it wasn’t about pushing myself. Now I find that I long for some challenge. I want to tackle some new techniques, stretch my skills, become a more accomplished knitter. I feel that I want to settle somewhere back in the middle of the spectrum between process knitter and product knitter – I want to produce beautiful finished garments, but I also want the joy that just fooling around with knitting for the sake of the process itself brings. I find myself thinking about designing; something I haven’t done for decades. 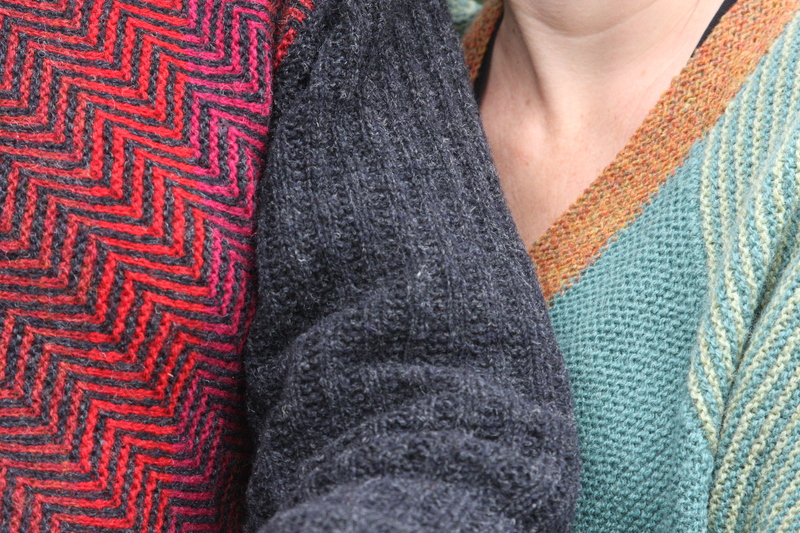 Brick was the first sweater that I cast on since beginning this blog, and I find that the very act of blogging about knitting is changing my relationship with knitting. It is more of an intellectual process. I want to bring my intellect, my creativity and my skill equally to bear on the projects I make. 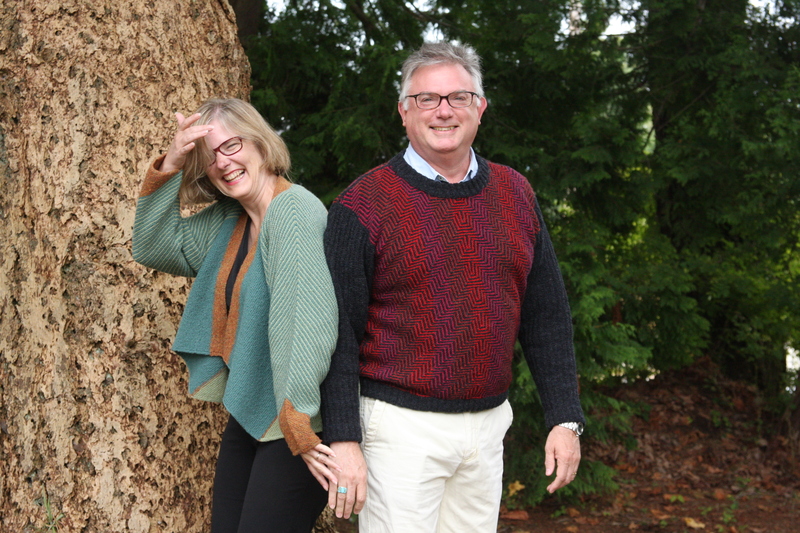 While thinking about this post and these two sweaters, I was fortunate enough to get Emma to take some photos of Doug and me wearing them. These photos were taken on August 26th, which just happened to be Doug’s 60th birthday. 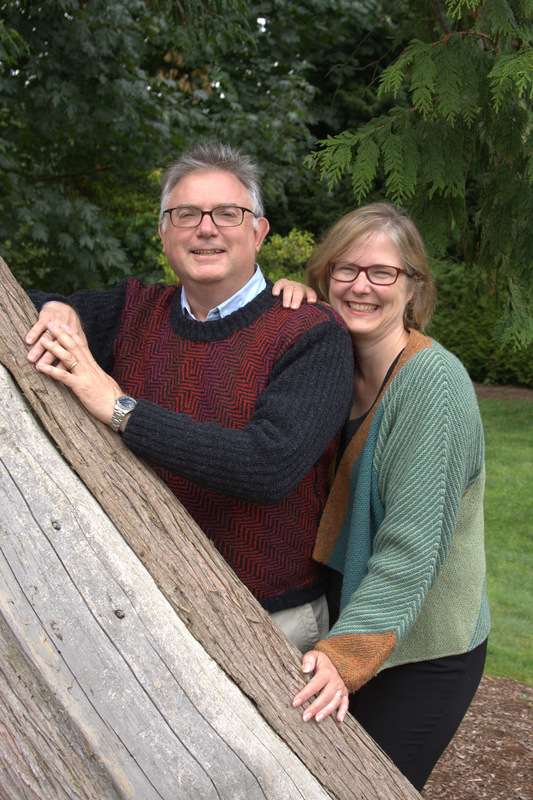 We took them in the beautiful garden of our friends, Mark and Teresa, in Washington state. As always, the blog has benefited from Emma’s great way with a camera. So, this has been the tale of two Falkenbergs. The story of two knitted garments and how they fit into a knitting life. And this is one of the things I like best about knitting – each item you knit holds a whole range of memories within them, a piece of your life written in wool.